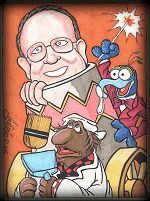 Sequestered in a small but cozy dressing room within Screen Gems Studios in North Carolina in the middle of January of 1999, I sat down for a talk with Muppeteer Dave Goelz. As carpenters and set builders hammered together Noah's Ark a few yards from where we sat, Dave and I talked about his background, work, and thoughts on his career. Dave Goelz performs on the set of Fraggle Rock. GOELZ: I have always enjoyed puppets, but at two times during my childhood puppetry became a hobby. When I was five I became a huge fan of Howdy Doody, and when I saw a Howdy dummy at the local toy store, I got very excited. My folks said that if I saved half the money, they would match my funds and I could get the dummy, which I believe cost either $3.95 or $7.95. I saved every penny of my 25 cents per week allowance, and in no time my parents were surprised that I was ready to make the purchase. The next Christmas my parents gave me a Howdy Doody marionette. During this period I was also interested in the original "Time for Beany" puppet show, starring Stan Freberg and Bob Clampett. I had Beany and Dishonest John hand puppets made by Ideal Toys, but was disappointed by the official rubbery Cecil the Seasick Sea Serpent puppet. My mother made a beautiful Cecil for me completely from scratch. She was a big influence; she showed that you could make whatever you needed. When I was thirteen, I became interested in marionettes. In junior high school I had become fascinated by the theater, with its curtains and colored lighting. My father built a marionette stage for me, and I equipped it with three strings of our Christmas lights; one whole string in blue, one in red, and the other in yellow. That way we could plug in different strings to make a range of colors. My friend Eddie Paul and I wrote scripts and put on marionette shows for our family and friends. I had a little printing press and we made tickets for the shows, for which we charged ten cents. We made well over a dollar in less than a month, easy money. After high school I studied to be an industrial designer, and entered the profession. After a couple of years I started watching Sesame Street on Saturday mornings and just got hooked. I had been a Muppet fan for many years, but now I started getting fascinated with the design process that went into what I was seeing on the screen. Who were these people who created the puppets, costumes and performances that were so evocative? I got very curious. One day, I read in a newspaper and read that Frank Oz was to appear nearby at a puppetry festival, so I took a day of vacation time and went to see him. I was just blown away by the two shows Frank did at Mills College in Oakland. During the first show, I was like an assassin. I was in a window above and to the side of the stage with a telephoto lens and a couple of rolls of film. It was fascinating to see Frank working. During the second show - they had to give two shows since so many people came - I sat out in the audience. I could feel the love for those characters all around me. After the show, I got up to go back home and back to my job of designing these boxes for scientific instruments. As I trudged to the car amidst a buzzing crowd, I had a strong feeling that I should be doing puppetry, but I had no idea how I could make a living at it. I didn't think there was any potential at all, so I was just sad. Within about a month of that day I was asked to make a business trip, which was a very rare event. Not only that, it took me to Pennsylvania. At the end of my work, I took a week of vacation time and went to New York and visited Sesame Street. How odd that my whole career grew out of six days of vacation time? I went to Sesame Street every day and just watched them work. Was the set more open then as opposed to now? Dave Goelz's Bunsen along with Steve Whitmire's Beaker are one of the most famous Muppet duos. GOELZ: At that time Sesame Street was shot at Teletape Studios at 81st & Broadway. I had pre-arranged with Frank Oz to visit the set. This was the fall of 1972. I watched them shoot for the entire week and they were all very kind to me. I had brought some puppets with me that I had made, and the Muppet people there said, "You should show these to Bonnie Erickson, head of the Muppet Workshop". So I phoned Bonnie and went across town to visit her. When I showed her my puppets, she said, "Oh that's great! You can build puppets. You should meet Jim, but he's in France right now." About a month after that, I was sitting at my desk in California and the phone rang and this voice said, "Hi there. This is Jim Henson." I went, "WHAA?!?" He sounded like Ernie! I jumped up and looked over the partitions around the lab. Everyone was just working normally, and I had Jim Henson on the phone! I could not believe it. He suggested that we meet in Los Angeles the following week when he was scheduled to appear on a Perry Como special. So we met in Los Angeles, and I showed him my portfolio. It was an industrial design portfolio that covered my career. It went something like this: John Deere tractor, American Airlines interior, Hewlett Packard laser interferometer -- puppet. I told him my objective was to illustrate how my background was perfect for becoming a puppet designer. In fact, it was. We agreed to stay in touch. I planned to borrow some video equipment and start performing in my own videotapes. In about a month or two I got another call from Jim saying, "I'm coming to San Francisco would you like to get together?" So I booked a hotel for him in Los Gatos. I took him out to dinner and when I picked him up he was waiting outside, a tall, gaunt figure standing in the rain. He looked frail and vulnerable. Later I would learn just how strong he really was. After dinner I showed him the tapes that I had just completed. This was around February of 1973, and he was contemplating doing a Broadway stage play that utilized many forms of puppetry. He asked me if I would be interested in being involved both as a designer and a performer. We stayed in touch and by June we worked out a deal where I came to work for six months on the designing and building phase of that project. During my stint, Muppets got a series pilot with ABC, so we put the stage play aside and worked on the pilot. Jim asked me to perform three characters in the show, so I stayed an extra couple of weeks for the shoot. Jim invited me to join the company, but I didn't feel at home in New York, so I went back to California. Dave Goelz performs Philo, one of the associates of the all-knowing Trash Heap. I had been on a leave of absence from my electronics job, and during the extra two weeks that I stayed in New York, I was replaced. I realized this was a good thing, because I had been afraid that I'd go back to work, get comfortable and secure and never pursue this work that I was passionate about. After a few weeks I started my own business doing industrial advertising and videotape work using puppets. Soon I had a couple of clients and was doing good business. After about 8 months, Jim made me an offer that I couldn't really refuse. Jim proposed that I keep my main industrial client, come to the Muppet Workshop as a designer/builder, and perform occasionally in specials. It gave me the Muppet work that I was passionate about and included several escapes to California each year. This was an example of Jim's business genius. He knew I didn't like New York, so he conceived of a deal whereby I would get to leave frequently to service my client. How could I say no? So I did it.